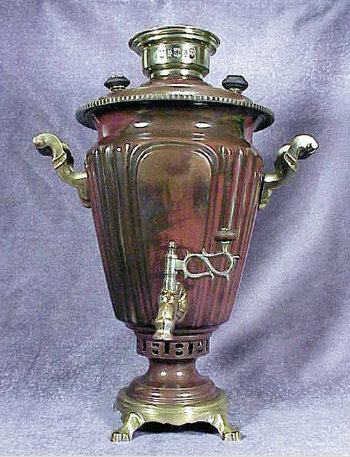 Historic Soviet Samovar made in Tula just after the Russian Revolution. As happened during times of war (including the earlier Russo-Japanese War), Samovar factories became armament factories during World War I. Samovars were destroyed by the very craftsmen who made them, as the skilled artisans of Tula and elsewhere used the metals to forge guns and armaments. As the war ended, guns, bullet casings, cannons & swords were again melted down and Samovar makers went back to making Samovars. This is an excellent example of extremely fine craftsmanship mirroring masterful pre-Revolutionary manufacture. Conical shape with panels on skirted circular base with traces of nickel detail. Rich, beautiful and rare variegated oxblood original patina. Detailed scroll handles. Dimensions: H 20" W 15"